The Royal Agricultural Hall, Islington (now the Business Design Centre).This Grade II listed building was opened in 1862 and was one of the world’s largest exhibition halls of its time. It was built to provide a home to the Smithfield’s Club annual exhibitions of agricultural produce and livestock (later known as the Royal Smithfield Show).However, it has been put to many uses over time and has hosted Crufts and the Royal Tournament as well as acting a temporary Parcels Sorting Depot during WW2. The hall fell into disrepair after the war and was not used again until 1986 when it was converted to house the Business Design Centre. “It’s all about Art” event and workshops run by the SAA, society for all artists. 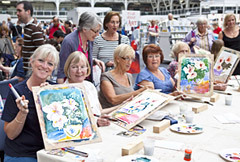 The show runs from 25th to 27th July and is an ideal opportunity to give painting a try. Whether just starting out or been painting for years, It’s all about Art will inform, encourage and inspire you to get painting and enjoy this rewarding and relaxing past time. Plus, there’s lots to see and learn whatever your ability, and you’ll have a fantastic day out with friends too. There’s something for everyone at this three day event and it is a great chance for you to come along and meet with celebrity TV artists, take part in hands-on workshops (with all materials included), watch demonstrations, learn handy hints and top techniques, get your hands on all the latest products and be inspired to try something new. Tickets are just £12 each and Cassini Map customers can receive a special discounted ticket price of ‘Buy one ticket and get the second for half price’. Just click here and enter the code CASSINI or call 0800 980 1123 and quote CASSINI when ordering. Why not order some tickets today as they make a great Father’s day gift too. Contrary to popular belief British shores have been invaded may times. The most damaging to our prestige and morale, since the Battle of Hastings, was a Dutch attack on The Medway in 1667, during the Second Anglo-Dutch War. Charles II’s Navy was in a reduced state due to recent expenditure restrictions. With London largely destroyed by fire the previous year (having already been ravaged by plague), Charles had his fleet laid up in Chatham. The Dutch decided this was the moment to attack, and it proved one of the boldest naval raids in history. The Battle of the Medway, as it was to become known, began on June 10, as the Dutch, with a fleet of about thirty ships, attacked the Island of Sheppey. Under the command of Lieutenant-Admiral Michiel de Ruyter the Dutch bombarded and then captured the town of Sheerness. By the 12th June 1667 they had sailed up the River Medway towards Chatham. The Dutch fired upon the few poorly-armed and poorly-manned ships they encountered, broke through the six-inch thick iron chain stretched across the Medway to the East of Gillingham Fort (the English fleets the primary defence against invaders) and upon reaching Chatham the dockyard was set ablaze and Upnor Castle bombarded. Fireships caused havoc with the moored English warships, burning three of the four largest “big ships” of the navy and ten lesser naval vessels, as well as capturing HMS Unity and HMS Royal Charles, flagship of the English fleet, which they towed away as war trophies. On the 14th June, fearing a growing English resistance, the Dutch decided to forego a further penetration and withdraw. After attacking several other ports on the English east coast, a failed attempt to enter the Thames beyond Gravesend and a Dutch marine force landed near Woodbridge north of Harwich, which was repelled, the Dutch fleet withdrew. The raid led to a quick end to the war and a favourable peace for the Dutch was signed on 21 July 1667. Lord’s Cricket Ground, is in St John’s Wood, London. Rather than referring to any connection with the peerage, Lord’s is actually named after its founder, Thomas Lord (1755 – 1832), an English professional cricketer who played first-class cricket from 1787 to 1802. It is owned by Marylebone Cricket Club (MCC) and is the home of Middlesex County Cricket Club. Lord’s is also widely referred to as the “home of cricket” and is home to the world’s oldest sporting museum. Lord’s today is not on its original site, being the third of three grounds that Lord established between 1787 and 1814. 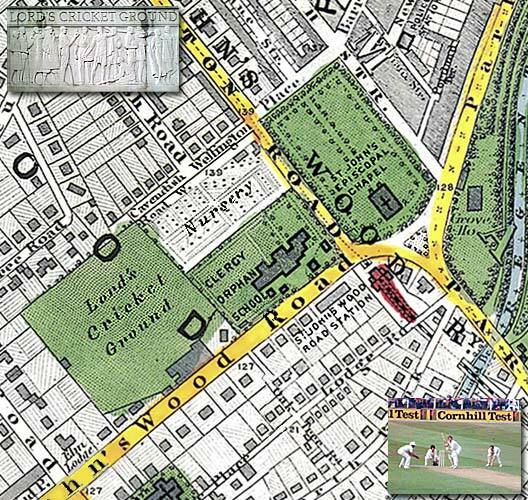 His first ground, now referred to as Lord’s Old Ground, was where Dorset Square now stands next to Marylebone Station. His second ground, Lord’s Middle Ground, was used from 1811 to 1813 before being abandoned to make way for the construction of the Regent’s Canal. The present Lord’s ground is about 250 yards north-west of the site of the Middle Ground. Next door to the ground can be seen the Nursery still referred to in cricketing circles as the Nursery End of the ground. The earliest known match played on the current Lord’s Cricket Ground was Marylebone Cricket Club v Hertfordshire on 22 June 1814. 1866-67 Freehold of the Ground purchased for £18,333 6s 8d. The main survivor of the Victorian era is The Pavilion with its famous Long Room. Lord’s is also the home of the MCC Museum, which is the oldest sports museum in the world, and contains the world’s most celebrated collection of cricket memorabilia, including The Ashes, which again will be the centre of this summers anticipated clash with the current Australian side.